On September the 9th, three of my friends and I left from Leuven, Belgium for what was meant to be a 6 day long mountain hike in the Spanish Pyrenees. The four of us, one aged 40+ and three 45+, come from very different walks of life, but we knew each other from a long time ago, one way or another. 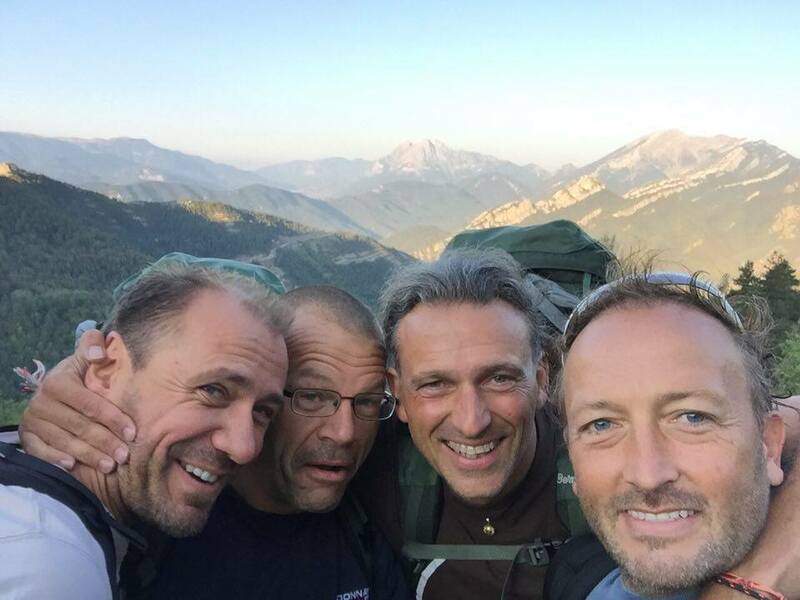 The 13-hour car drive to the Catalonian mountains was a good warm up for what would become the typical 4 boys fun hike. 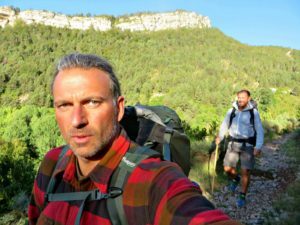 We had decided to start from the Refugio Rebost, where I had spent 4 days back in 2010, exploring the vicinity of the refuge, together with my wife and two kids. The refuge keeper, Anna Mañach is —as almost all of the refuge wardens are— very friendly, providing you with passion with the necessary information and advice for the hike. 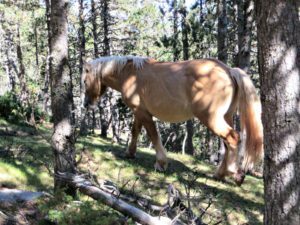 The trail we walked is called Cavalls del Vent, meaning Horses of the Wind, in Catalan. Cavalls del Vent is a 360º trek with the start and end at the same refuge. The hike can be started from any of the eight refuges. Although the route is signposted with orange marks, it is essential to use the offcial Cavalls del Vent map, with the emblematic trail clearly marked on it. Cavalls del Vent is situated in the Cadí-Moixeró Natural Park. Cadí-Moixeró Natural Park is a mountainous region with altitudes rating from 800 metres to 2,642 metres. It contains great ecological diversity, with various types of forests, rocky zones, alpine meadows and water courses, supporting a wide variety of fora and fauna. The many different species of animals and plants represent Mediterranean, Alpine and Euro-Siberian environments. The Park has a wide range of services such as mountain huts, information centres, viewpoints and a network of more than 400 kilometres of waymarked footpaths. It is the perfect spot for hikers and nature lovers. 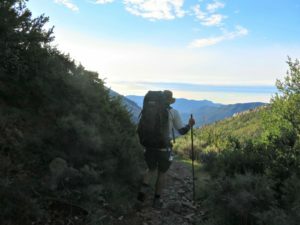 The trail offers over 80 km of track, running between the 902 m high Bastareny river valley and the 2,513 m Niu de l’Àliga shelter; accumulating a positive difference of 4,800 m. This makes the scope of the walking variety of ecosystems and spots as emblematic and spectacular as the summits of Tosa and Penyes Altes de Moixeró, the north face of the Cadi, the Pedregosa and Gisclareny mountains, Pedraforca, the Gresolet shady, Empedrats and Bastareny and Grèixer valleys. Arriving on Saturday afternoon, September 10th, we took the time to prepare our gear and to enjoy the breath taking scenery. After a hearty dinner we went to bed early. In the (Spanish) mountains, people go to bed early and you are asked to be quiet from 9 p.m. 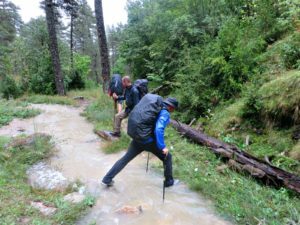 The next morning, after a typical Spanish breakfast we took o_ at 08:30—a departure time we would repeat each day—gaining an altitude of 880 metres to the Refugio Nio de l’Aliga. There we took a 20 minute break before continuing to the next refuge where we would sleep. This hike took us about 7 hours, the breaks not included, going uphill about 1240 meters and 1446 downhill. At one point we descended about 400 meters in a very short distance, which took its toll on some of the knees of the 4 Belgian Cavalls. Walking 19.7 kilometres with a heavy backpack—we are too old school—on the first day in the mountains is a long long way. We were all pretty tired but happy and inspired by what our eyes had seen. The day before, the weather had been incredible, and so it would be for the two following days. Another long hike, of 16.6 kilometres, climbing 1,024 metres and descending only 418 metres, would take us about 5 and a half hours, not taking into account the breaks (only a few). Refugio Prats d’Aguilo, our home for one night was located above 2,000 meters, with a view like it was in the perfect movie. The warden was very friendly and the dinner was a feast. We chatted with some other hikers, all of them Spanish. They all did the hike with very lightweight equipment and the very minimum of gear. These days young people seem to be more inspired by the trail running kind of spending time in the mountains, than by alpinism or old school hiking. Anyway, they couldn’t believe it when they checked out how ‘heavy’ our backpacks were (we thought we went minimalist, this must have been the first time in years that I’ve left my axe at home and took only one knife!). Another day full of sunshine and mild temperatures. 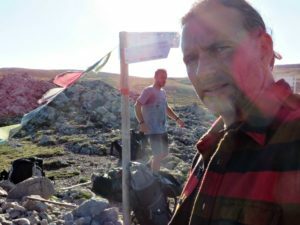 After a long hour of sturdy climbing we arrived all of a sudden at a monument, decorated with the typical Nepali flags, on the pas dels Gosolans; a plateau which reminded me of the Mongolian steppe. Our initial plan was to stop at Refugio Lluis Estasen and climb the emblematic Pedraforca the next morning, continuing to Gresolet in the afternoon, since that Refugio was only 1 hour 30 minutes further on. But bad weather was announced the day after, so we decided to continue to Gresolet the same day. Another steep downhill took the toll on some of us and so we slowed down the pace. Nevertheless we arrived pretty early in the afternoon and decided to crack a bottle of cava, celebrating the good times with our Spanish friends. The weather forecast had been spot on. Only moments after leaving at 08:30 in the morning, it began raining. Seconds later the water was pouring down, transforming the trails into rivers. The first 2 and a half hours were all but pleasant. We all had the necessary rain gear, but sooner than later we were soaking wet; even our boxer shorts. It was too cold to pause and, the trail being downhill, we walked faster than ever. After a while we didn’t even try to avoid the puddles anymore. Around noon, the weather improved considerably and we rediscovered the pleasure of hiking. 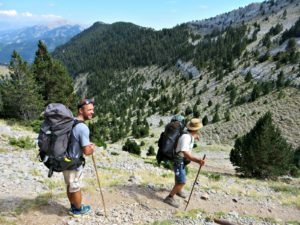 On the Cavalls del Vent trail, we met our Spanish friends, ready to continue after a break. They assured us only 4 kilometres separated us from our basecamp for the night: Refugio Sant Jordi. We went into a steep gorge, encountering lovely little waterfalls. But the climb was long and steep, the 4 kilometres turned out to be 6 kilometres. After a five hour long adventure, ascending 1,009 metres and descending 667 metres, we arrived at the refuge. The morning of our last day started crisp and sunny, but soon the sun warmed our bodies. A great last hiking day was in the making. Only 11 kilometres and about 3 hours 30 minutes separated us now from completing the Cavalls del Vent. The first part of the trail was surprisingly easy going, descending almost all the time, but not as abrupt as other descents we had experienced before. The last hour, and certainly the last half hour was tough, climbing steep hills without rest. Every time we thought we would see Refugio Rebost there was another corner with another steep hill to climb. At the end, my beloved Refugio Rebost awaited us with celebration and feelings of joy and sadness, the joy because of having accomplished a nice challenge, the 4 of us together, and sadness because a 5 day long, never to be forgotten adventure of 4 friends had come to an end. Even if Cavalls del Vent is not the high Pyrenees, it’s no coincidence that The Cavalls del Vent tour is the location for the early 110 kilometres long ultra-run. The trail lies about one to two hours from the big city of Barcelona, and yet you are 100% immersed in nature. It’s very diverse with different influences. One moment you think you are lost in the Austrian Alps, only minutes later you are crossing the typical Mediterranean woods, with a Catalonian bright sunshine pushing its way through the trees. When having the next Refugio in sight you think you are in Switzerland. Once inside the refuge the incredibly good Spanish mountain food leaves you wanting to immigrate to Spain forever. The trail is constantly flirting with the tree line, making variation the main characteristic. It’s all about a mixture of various flavours, sceneries and people along the trail. We did this tour in September, so it wasn’t crowded at all. As always, I would suggest you go there with the necessary physical preparation and gear, making the tour much more enjoyable. About the gear, it’s tough to say. One tends to think, “Well it’s Spain, it’s close to the Mediterranean, so heat and sun is guaranteed”. We had good weather 4 out of the 5 days. But being at an altitude between 1,280 and 2,510 metres, I prefer to expect any kind of weather and go prepared and equipped accordingly. I think doing the hike in 5 days, as proposed by Rebost warden, Anna Mañach, is ideal. It’s the perfect mix between a physical challenge and still having enough time to enjoy your surroundings. Was it the weather, was it me being totally relaxed, was it the food, or was it my three companions? I don’t know. But boy, did I enjoy this hike!! Cavalls del Vent, we might be back sooner rather than later!